We had a lovely cooked breakfast (although we’ve had so many recently, I’m starting to crave cereal!) in the pub where we stayed last night. Before we realised, it was half past nine so we got our things together and headed off. My Uncle Andrew (my mum’s twin brother) had driven down from London and was cycling from Bristol to meet us. We’d planned to meet somewhere near Weston-super-Mare but to get there we had to cycle out of Burnham (google maps seemed to want to take us along the beach, which we thought probably wasn’t a good idea) and get to the new Brean Down cycle track. It was lovely, very picturesque with an amazing ruined church on a cliff top at Uphill Park. Uncle Andrew wasn’t far away so we met on the sea front. We decided to have lunch in Clevedon so set off. The A390 was very busy but we were able to turn off onto the Strawberry Line (which I’ve cycled lots with my family and is lovely) to Yatton and then on back roads to Clevedon. Unfortunately the rain started and the temperature dropped and we all started to get very cold, even with our waterproofs on. So lunch in a cafe in Clevedon became a sandwich from Tesco’s and we set of to Portishead. The wind must have been behind us because I felt like we were flying along, dad was setting a good pace all the way to the M5 bridge. By this time I couldn’t feel my feet (I didn’t put my overshoes on!) just wanted to get home. So over the bridge, along the Portway and home! I ran inside and jumped in the bath to warm my feet up. Then I had a shower! Then I lay on the sofa, under a blanket catching up with my friends until tea. Today was a day I was really looking forward to but also really nervous about. More of that later though! My best friend Evie got to our house at 7:30am. She’s a master at french plaits, which are perfect for when I’m riding so I’d arranged for her to come and redo my hair (and a gossip of course!). Dad and uncle Andrew got the bikes all ready, we said goodbye to the twins who we won’t see for about a week and then we cycled off to my school, Redmaids’ High School. Mum (who is also a teacher there) had told us to be by the gates at 8:50am OR ELSE! 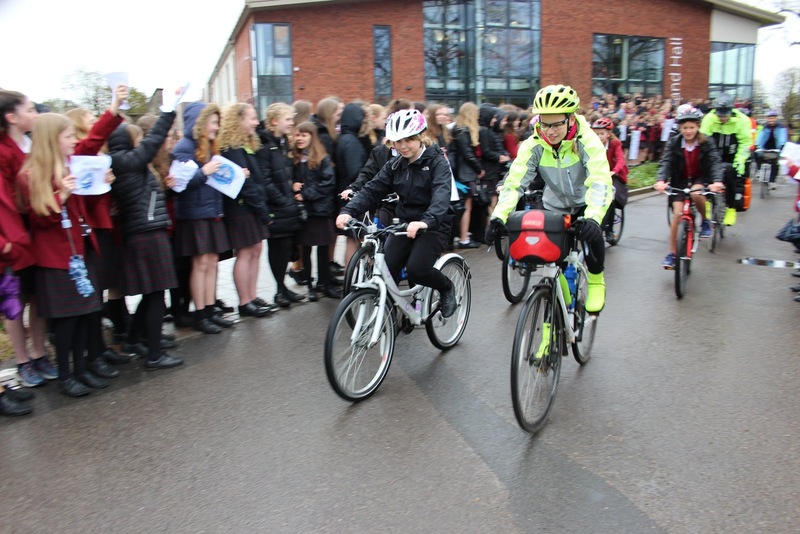 Luckily we were and we were met by lots of other pupils and staff on bikes (some of them not really the right size, Mr Wyatt! ), including my mum! And then Oli Beckingsale, the Commonwealth and Olympic mountain biker turned up too! He’s one of dad’s local heros (he’s a Bristolian, like all the best people😉) and he had a lovely road bike which uncle Andrew and dad were both drooling over🙄🙄. I could imagine my mum shaking her head and saying “men.....”. 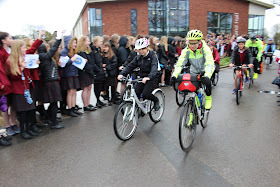 There was loads of noise coming from the front of the school building and after a few photos, we were told to cycle up the drive in a big convoy. We came around the corner and the WHOLE SCHOOL was lining the drive, despite the rain, all cheering and waving banners they’d made. I was really embarrassed but also incredibly proud too. 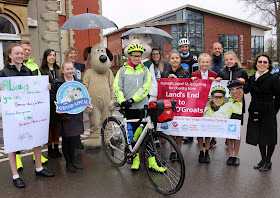 The school has really got behind my ride. Loads of people had cycled in that day. They had a bike that made smoothies and 4 spin bikes in reception. All day teachers and pupils were riding two of them to try and ride more than 247miles in a day which was our total for the last 5. Miss Owens-Powell, my drama teacher had come in at 7am and had already done 25miles before we got there! There was a huge Wallace and a huge Gromit character there (I think two of my teachers were inside, mum said they were all desperate to dress up!!) and a representative from British Cycling. It was really, really cool! But, we had to leave all the fun and start our ride. We had one more quick stop first though. Mrs Wright, the headteacher of Elmlea Junior school (my old school) had invited us down to say a quick hello before we set off. We got there to find all three of the year five classes in the rain, ready to wave us on our way. My brother and sister are in year 5 so we got to say goodbye to them again, answered a few questions about our ride and then off we went. I think we all felt a bit sad to be leaving all the fun behind and to set off into the rain! Dad and uncle Andrew had plotted two routes, a quiet road one and a busy road one. Usually we go for the quiet roads but it said it’ll would take nearly an hour longer so as the weather was so miserable, we’d go along the A38. It was a quite busy road but was fine. There was lots of water on the road so lots of spray though. It was hilarious at one point when a lorry drove past dad who was leading and made loads of spray. Dad disappeared completely but all we could hear was him laughing really loudly!! We got to Slimbridge and decided to find some lunch. We found a nice cafe by the canal. Dad had the biggest cheeseburger ever, though my hot chocolate was pretty enormous too! Back to cycling - we tried the tow path but it was slow, bumpy and muddy so gave up and went back to the A38. This took us through Gloucester in the pouring rain, to Tewkesbury in the still pouring rain! We were booked into another pub. Uncle Andrew stayed for a coffee and some food then rode off to catch a train back to Bristol to then drive to London😟. They’ve put our bikes down in the cellar out of the weather, which is cool. Dad has turned the radiator up to max to dry the gloves and socks (the rain resistant leggings and the jackets dad left in Cornwall but which were returned to us kept us really dry). Still had ice cold feet though, despite two pairs of merino socks AND my overshoes. Oh - and mum said they absolutely smashed our 247miles at school today.